Yahav-Hamias Drop-Thru rotary airlock feeders are designed for economical and reliable material metering and airlock service. The valves can be used in various industries such as food, plastics, chemical, asphalt, mining, baking, cement and more. Yahav-Hamias drop-thru valves are available with square or round flanges, outboard bearings and replaceable shaft seals. Available in Mild Steel, SS 304, SS 316 and other special alloys. Yahav-Hamias Drop-Thru Rotary airlock feeders (also known as "Rotary Feeder Valves") are designed for economical and reliable material metering and airlock service. The rotary valve consists essentially of a rotating vane-rotor operating in a housing. The material enters between the vanes from one opening in the housing and is delivered through another. 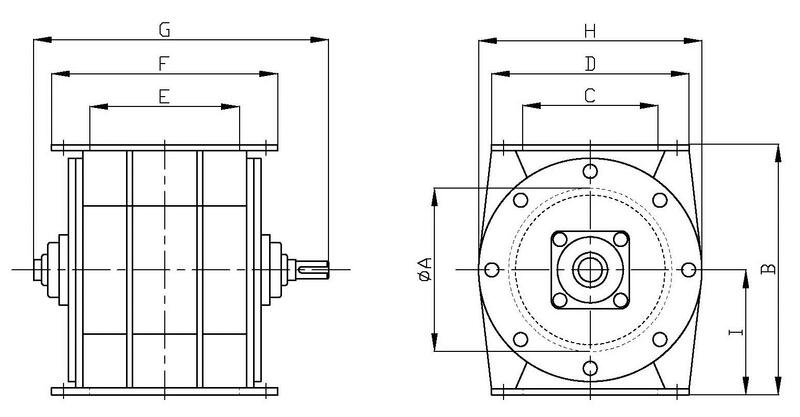 The control of material flow is obtained by regulating the speed of the rotor.